A few days ago, I was inspired by a set of photographs of Earth from space, at night. 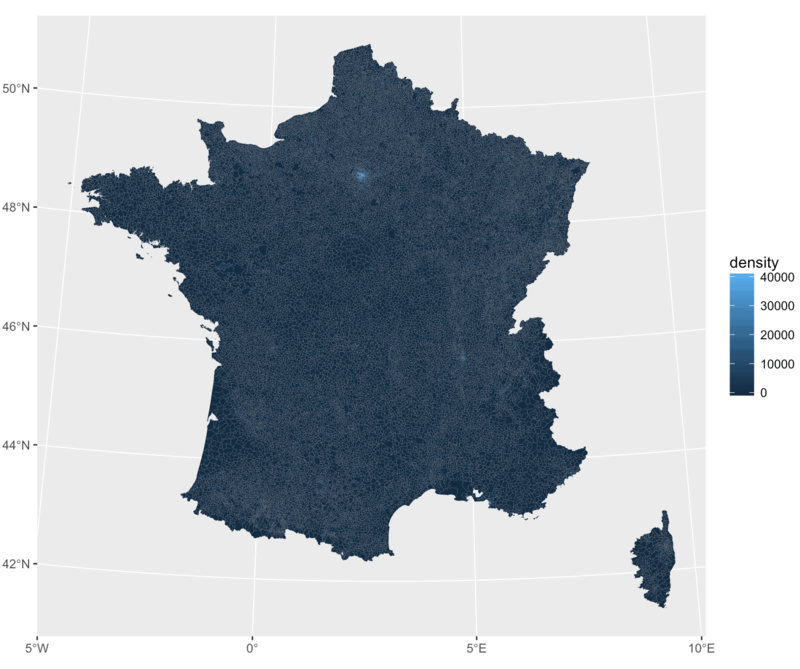 The images are amazing, so I decided to try to replicate them using R.
To be a little more specific, I found a single dataset – a data set with French population data – and I’m using it to replicate the images for a single country: France. As usual, I’ve included the code for how to create the final data visualization. Having said that, in this case I decided to use some new tools. Therefore, before trying to run the code yourself, there are a few notes and caveats to keep in mind. I decided to build this with the new sf package. sf is a new package for geospatial analysis that’s currently under development. You can read more about it here. Before getting started, you should know that installing sf may require you to install some dependencies. You can find out more here. If you decide to install sf and the dependencies, be warned: getting the dependencies set up (specifically, gdal) may be tricky and problematic, so attempt it at your own risk. Notice also that we’re using the development version of ggplot2. We need this because we’ll be using geom_sf(). We won't have to make too many adjustments to the data, but we will transform the variable names to lower case. In the visualization, we're going to plot population density. The dataset does not have a density variable, so we need to calculate it based on population and superficie (i.e. area). Keep in mind that superficie is in hectares, so we'll be converting from "people/hectare" to "people/square kilometer." Next, we'll plot a very simple test chart to see if things are roughly OK.
As we do this, note how simple it is to use geom_sf(). This is one of the advantages of using the new sf package. This appears to be OK, but it's tough to tell because the borders are too thick. Ok, we can see the fill color now (although the borders are still there). Most of the remaining work will be modifying the fill color to get the colors right, and adjust the scale so that differences between densities are more visible. Ultimately, we need to adjust the fill-colors associated with the fill aesthetic. We need to find "break points" to which we'll associate specific fill values. To do this, we'll calculate quantiles. Let's plot the finalized version. I'll give a little explanation afterwards. 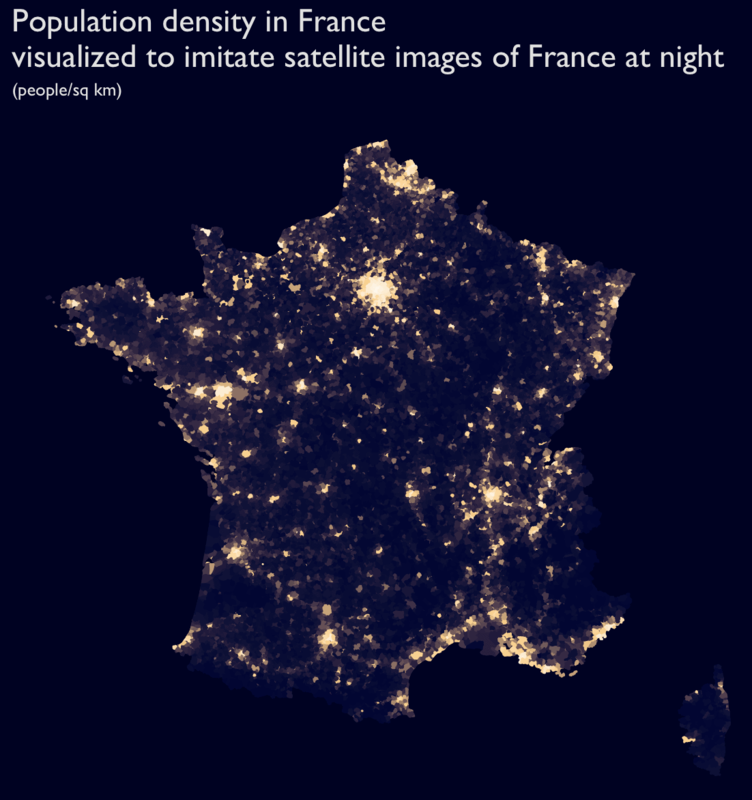 labs(title = "Population density in France\nvisualized to imitate satellite images of France at night"
OK, the truth is that to create this finalized version, you actually need to do a lot of trial and error. Essentially, you need to find the right cutoffs in the data and associate those values to specific fill values. Here, we're taking values of our fill variable, density, and we're associating those values to specific colors. How do we know which values to use and which colors to use? You need to take the quantile values that we calculated earlier, and test them out. Try different cutoff values for values = . Try different fill-values for colours = . I'll admit that this data visualization is a little challenging to create, simple because of the extensive trial and error that's required. It's also a little out of the ordinary, because we're using the some packages that are under development. Having said that, this visualization is still essentially just a fancy application of ggplot2. If you really know what you're doing with ggplot2 – if you've already mastered the basics – then this plot is fairly straightforward. So, if you want to learn to create compelling data visualizations, master ggplot2. To get a job as a highly-paid data scientist, you need to know how to create compelling data visualizations. To create compelling visualizations in R, you need to master ggplot2. Sign up now we'll show you how. In addition, you'll also get weekly data science tutorials, delivered right to your inbox. data length  is not a sub-multiple or multiple of the number of rows '. Any suggestions on how to get this to work? You’ll need to send some other files for me to read in the shapefile. Once I have these, I’ll try to replicate your problem. I have opened a thread on Stack Overflow on the issue (https://stackoverflow.com/questions/42811762/reading-a-shapefile-and-plot-with-geom-sf-returns-error), but I think there might be a problem with the shapefile, and I am unsure whether that can be resolved.